Entrance A or Entrance B? We make our choice and enter a metal corridor. The door behind us shuts and we are immersed in total darkness. Voices echo in the distance. Our eyes, unused to such an intense nothing, try to compensate by creating strange made up splodges that float just out of reach. We reach out to touch the wall and feel them vibrate with strangers’ footsteps. Slowly, we feel our way around the inky maze and eventually emerge into white light. The Decision Corridors (above) are genuinely disconcerting and a perfect gateway into Carsten Höller’s wonderland. High above us is a massive mushroom mobile. We turn the dial and watch them fly over our heads. These fly agaric, red and white mushrooms are naturally occurring hallucinogens that feature in many works of literature (including one of my childhood favourites, Alice in Wonderland). Pharmaceutical time passes with Pill Clock (below). 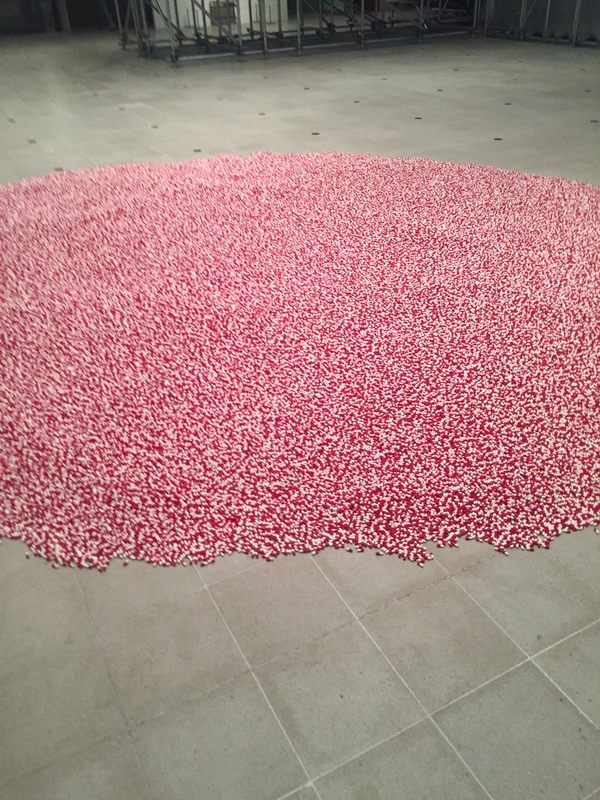 Every three seconds, another red and white pill falls from the ceiling to add to the ever increasing mountain on the floor. The Forests is a very unsettling experience. It’s a fully immersive dual screen video experienced by a virtual reality headset and headphones. I watch people coming away afterwards: some are shaking their heads as if trying to re-connect with the room. When I put the headset on, I realise why. I am in a snow covered forest. A little way in, my eyesight is split in two as I navigate around a tree – my left eye veering off one way, my right eye in the opposite direction. Höller says this experiment in seeing double is an attempt to ‘disrupt the hierarchy of a single image’ and it certainly disrupts my internal hierarchy. I feel very disorientated and nauseous for a good few moments after I leave the trees. Two lonely hospital beds (Two Roaming Beds) covered in crisp white sheets roam slowly but purposely through the lower floor of the exhibition. Are they awake? Or are they sleepwalking? Dreams, for Höller, are a ‘short cut’ to a special kind of madness that we all have access to. Where do we go when we dream? Will we be the same when we awake once more? Upstairs, a corridor of television features sets of twins. Each twin faces the other, exchanging a series of sung or spoken sentences. It’s a strange, intense experience walking down the middle of their relentless gazes, trying to make sense of snippets of conversation. Höller records a new set of twins in every city this exhibit is seen in – there are now 7 Twins endlessly talking and teasing. A giant white Dice is an internal playground for children. They clamber through the black dots. It’s clearly an exciting experience for some and a slightly unsettling one for others who emerge looking for their parents – before going straight back in again. Mirrors are placed around the walls. We watch ourselves and watch others watching us. I realise I look subtly different and then realise why. I am not looking at my mirror image but rather seeing myself as others see me. Seeing the world upside down while I remain standing upright is a novel experience. 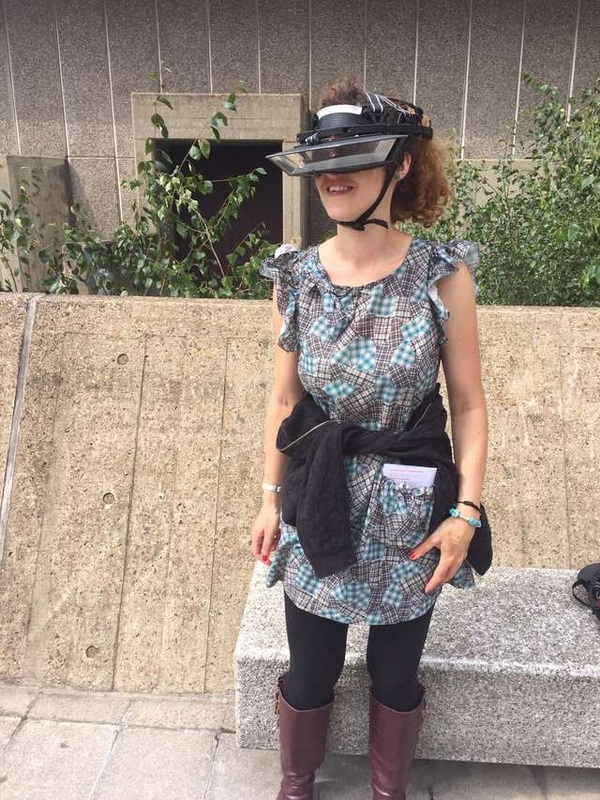 Some people manage to walk around quite happily on the roof of the Southbank Centre with the Upside Down Goggles but I am not one of those. My hand remains close to a wall for balance as I experience my strange new world. The final decision is which slide to take to exit the exhibition – a glorious fast fall through space. This is art that produces a physical reaction. 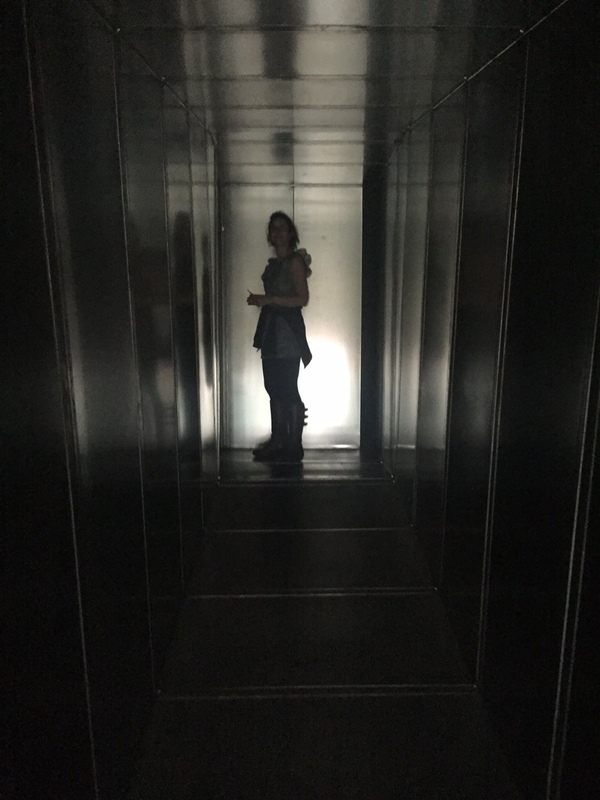 It is not a passive experience – we become part of the artwork as we move around and interact with the exhibits. Höller says museums offer a ’space and time where you try things you can’t try otherwise.’ As I watch people’s reactions as they fly above Waterloo in one of the Flying Machines or emerge exhilarated at the bottom of the Isomeric Slides, I think that is exactly right.